Edmonton is committed to sustainable waste management and Enerkem's Waste-to-Biofuels and Chemicals Facility—part of the Edmonton Waste Management Centre—demonstrates this pledge to finding innovative solutions to harness the value in waste. Edmonton currently diverts more than 50% of residential waste from landfills primarily through recycling and composting. The Waste-to-Biofuels and Chemicals facility, once fully operational, will contribute to the City's vision of achieving 90% diversion on residential waste. At full capacity, the facility will produce 38 million litres of clean fuels and biochemicals. It will initially produce methanol and later ethanol. The production capacity of ethanol will help fill the tanks of 400,000 cars using a 5% ethanol blend with gasoline. The feedstock for producing biofuels is municipal solid waste that cannot be recycled or composted and has traditionally been sent to landfill. Using waste to produce cleaner burning fuels is a major leap forward in Edmonton's commitment to using waste as a resource and becoming an energy sustainable city. 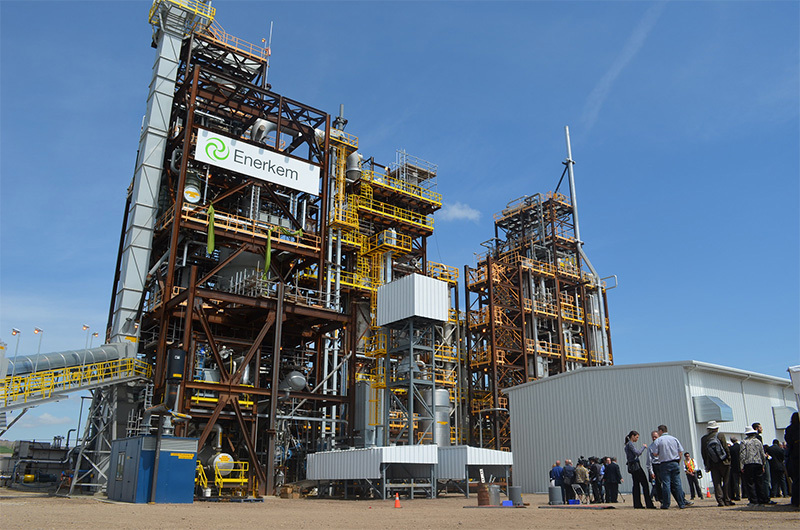 The Waste to Biofuels and Chemicals Facility is part of a larger initiative between Enerkem, Alberta Innovates – Energy and Environment Solutions and the City of Edmonton. This waste to biofuels initiative also includes a waste preparation facility and an Advanced Energy Research Facility, both owned by the City of Edmonton. Using waste as a resource for fuel will contribute to greenhouse gas (GHG) reduction, reduce the need for food crops as feedstock for ethanol and enable Alberta to lead the way in advanced biofuels production.